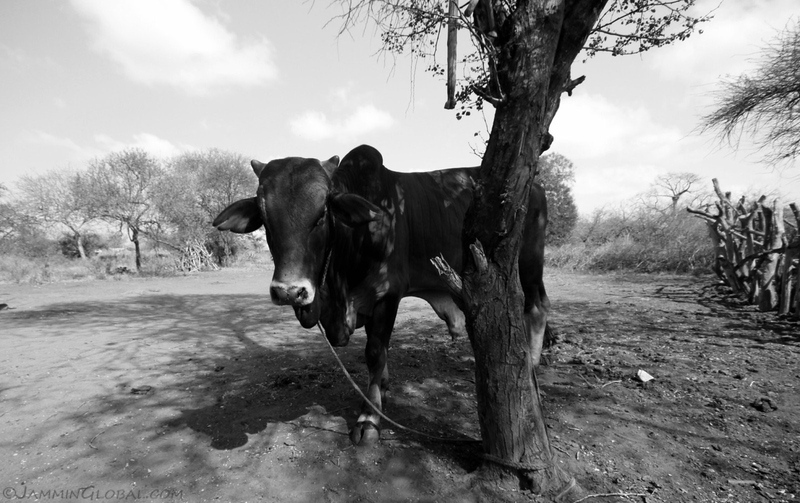 For the second half of the field work for my research into gender and agricultural water management, I moved to Makindu. It’s further down the highway towards the coast and lower in elevation than Machakos. 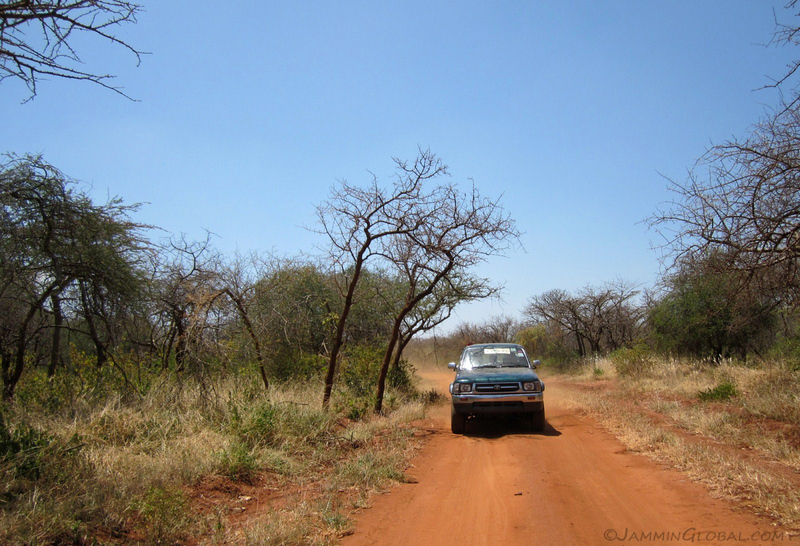 The land was considerably drier and the farms were bigger as the terrain wasn’t hilly. The farmers here were more enterprising that those in Machakos and were producing honey and other crops, like tomatoes along with maize. I witnessed a food aid distribution and while feeling for the farmers whose plight has driven them to stand in line for food hand outs, I was warmed over by their smiles and laughs. Most of the farmers I interviewed were in poverty conditions, but they weren’t moping about their situation; they were just putting up with it and asking us researchers what they could do to improve their farm productivity so that they could once again become self-sufficient. I stayed at the guest house at KARI Kiboko, which is near the town of Makindu where there is a Sikh Gurdwara – their temple. 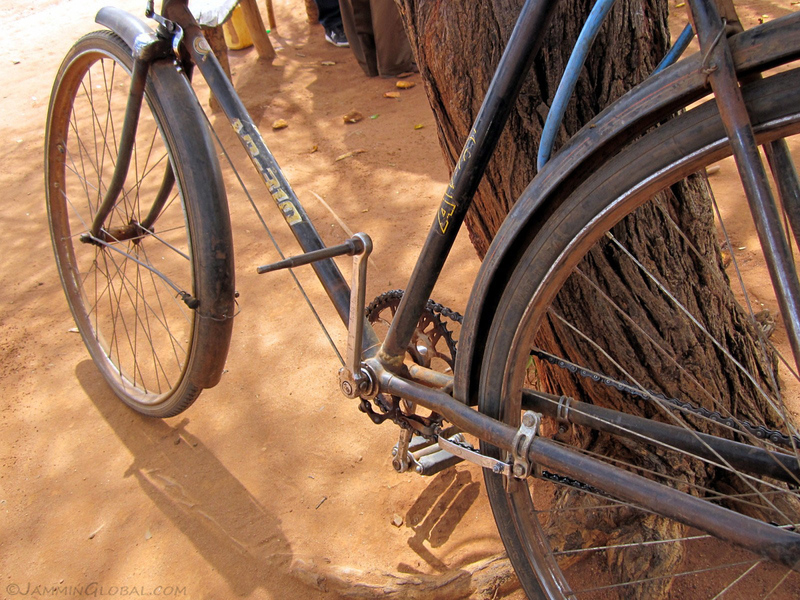 I visited a few times and enjoyed the tranquil setting among the hustle and bustle of a Kenyan highway town. At the end of my stay, I visited another KARI research station, this one in Naivasha and took in the beautiful settings that Kenya has in abundance. …bouncing along in a truck. 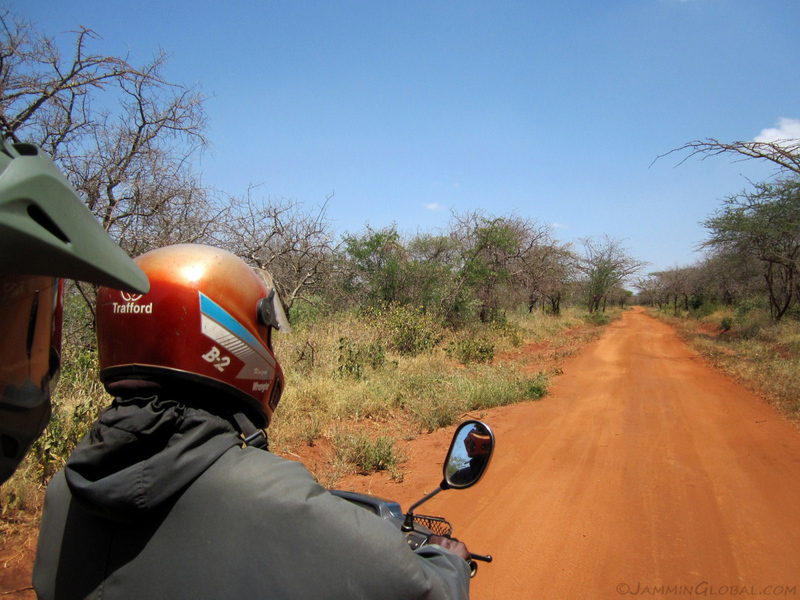 I never forgot that I was riding back and forth across the backroads of Kenya’s savannahs. 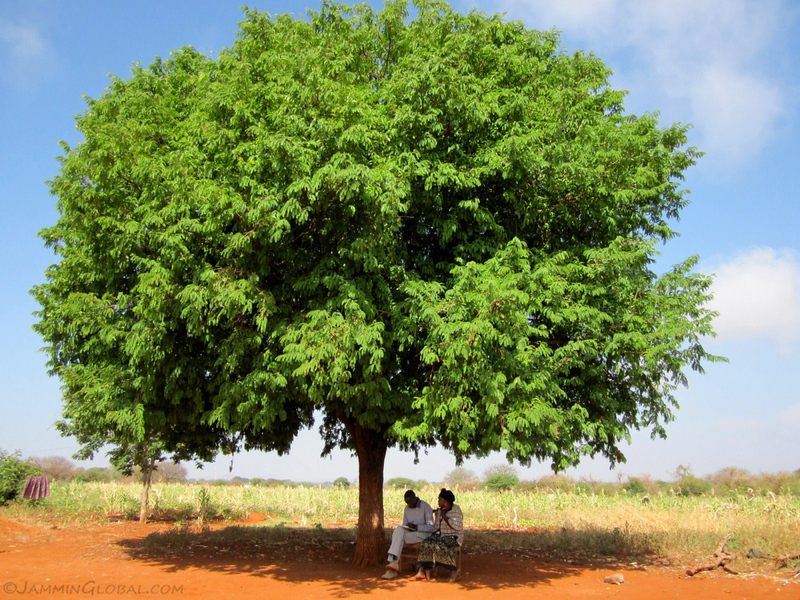 Bill Musembi conducting an interview with a woman farmer under this tree on her property. 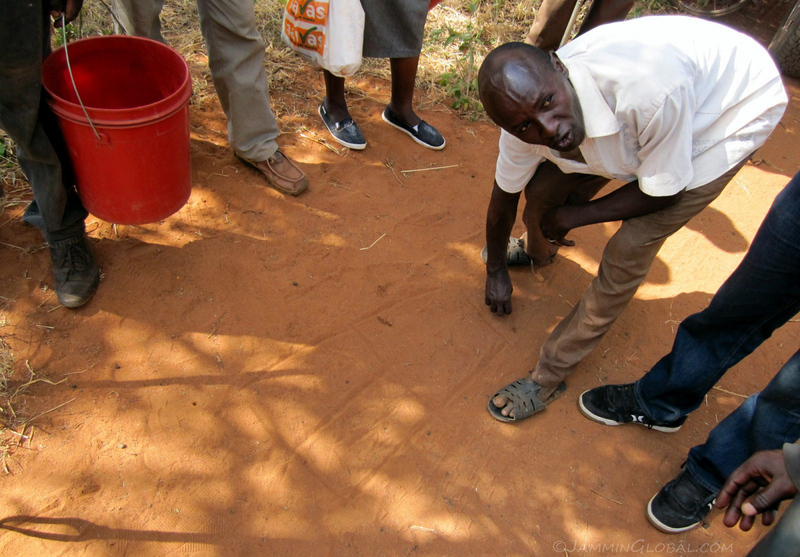 A male farmer showing us the layout of his farmland so that we could decide where best to take the soil samples from. 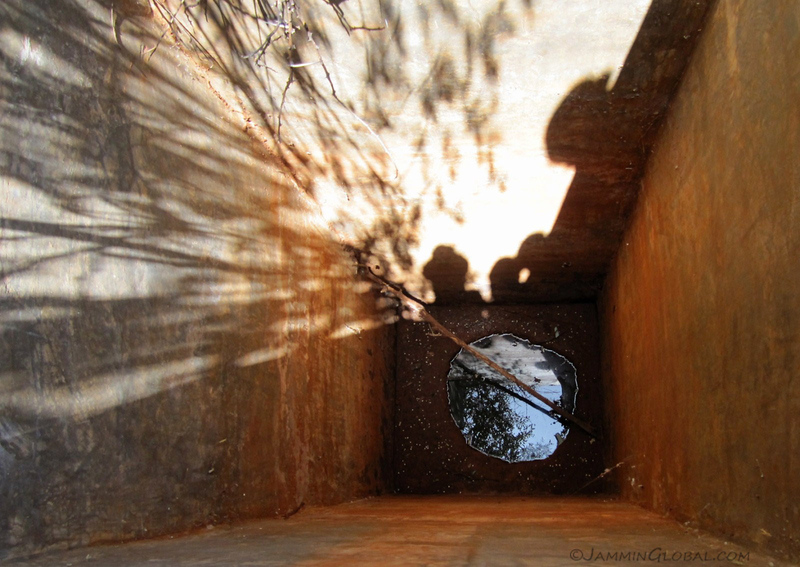 An auger full of a soil sample. 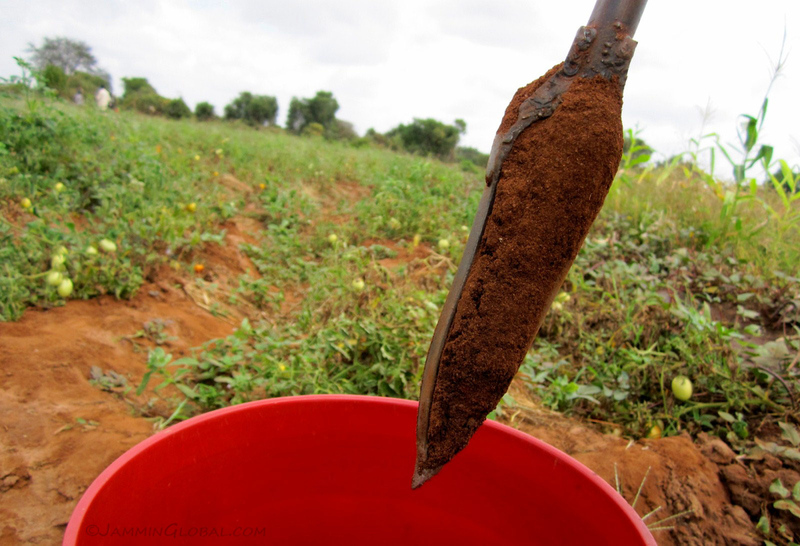 I was taking a sample of the soil up to 20 cms deep from various locations on a given farmer’s land and then combining that into a representative sample, because I wanted to see if there were differences in the fertility of the soil between the farms run by women and those run by men. In the end, I didn’t find much difference between the genders, but there was difference in the two locations, as expected. 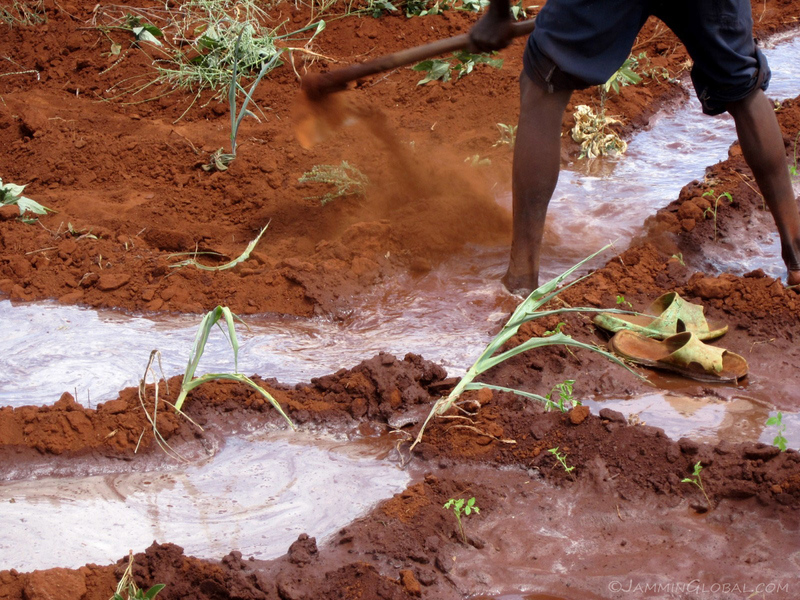 All farmers’ soils were poor in the main ingredients of carbon and nitrogen, along with low quantities of phosphorous, meaning that they were not applying any nutrients to the soil after the crops had used them up. Fertilizers have a bad reputation among the health conscious, but crops won’t grow without them. The key is to use natural fertilizers, not chemically synthesized ones. 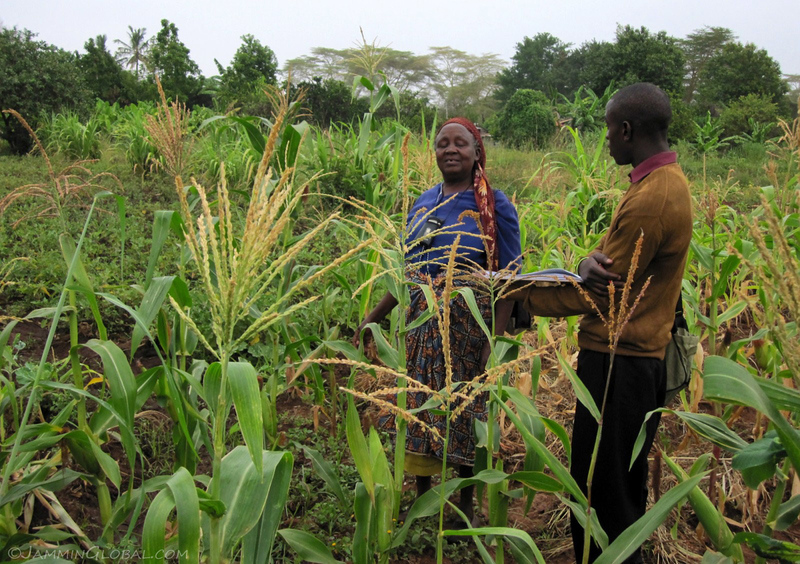 Chris interviewing a woman farmer who was proud of her healthy maize crop. 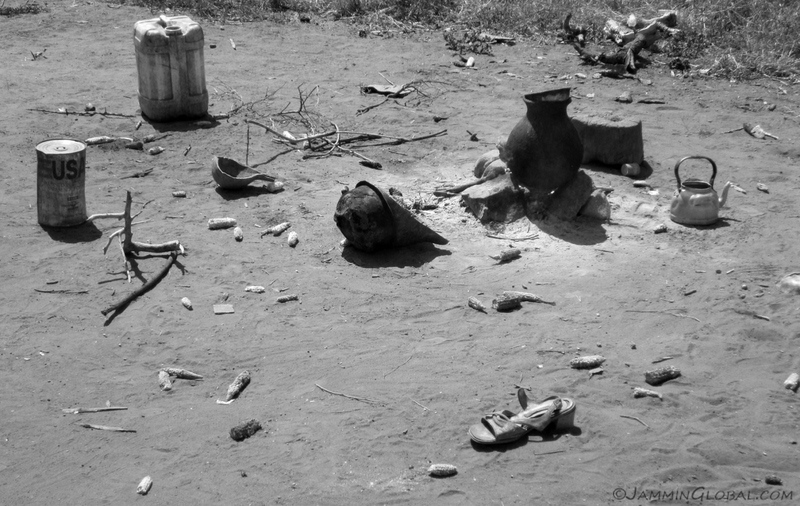 …some were in worse condition than others. …opened up another channel to be irrigated. Hard work in the heat. 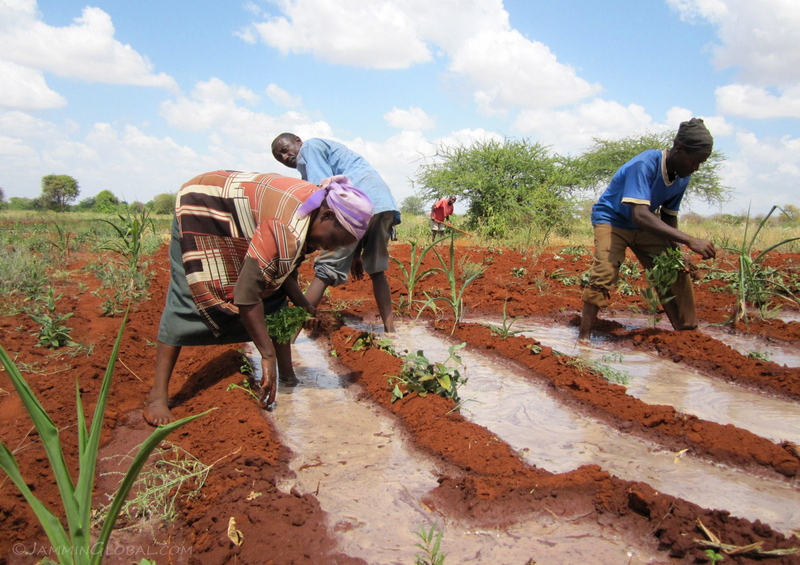 Farm help coming behind the irrigated channels and planting seedlings of tomatoes and maize. Irrigation definitely falls under agricultural water management, but most farmers can’t implement it since it requires being close to a water source and having enough capital to pay for a water pump and fuel, so most farmers just rely on the rains, which are becoming more erratic over the years. 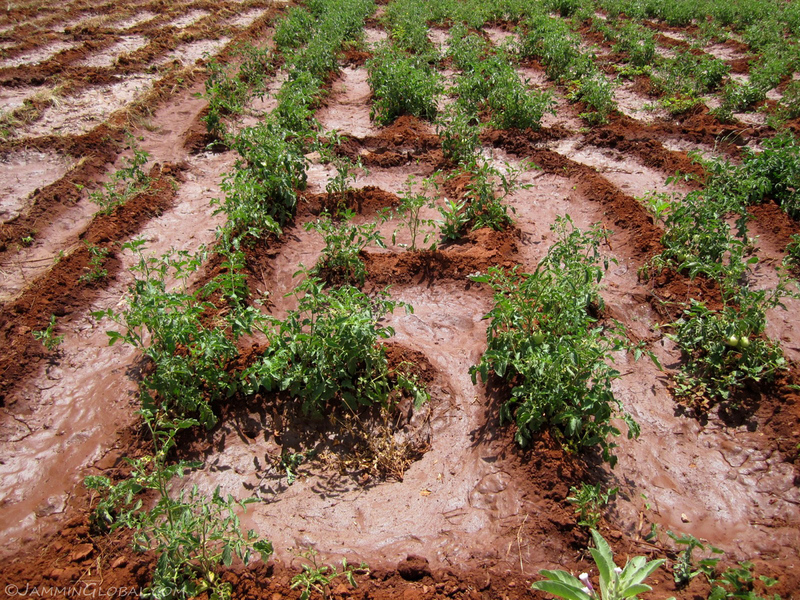 Tomato plants coming up in the irrigated lands of Makindu. But maize is the still the primary crop for most farmers. It’s a hardy crop and can generally do well even in dry areas depending just on rainfall during planting. But it’s not the most suitable crop for this kind of climate, needing more water to produce full ears of corn. 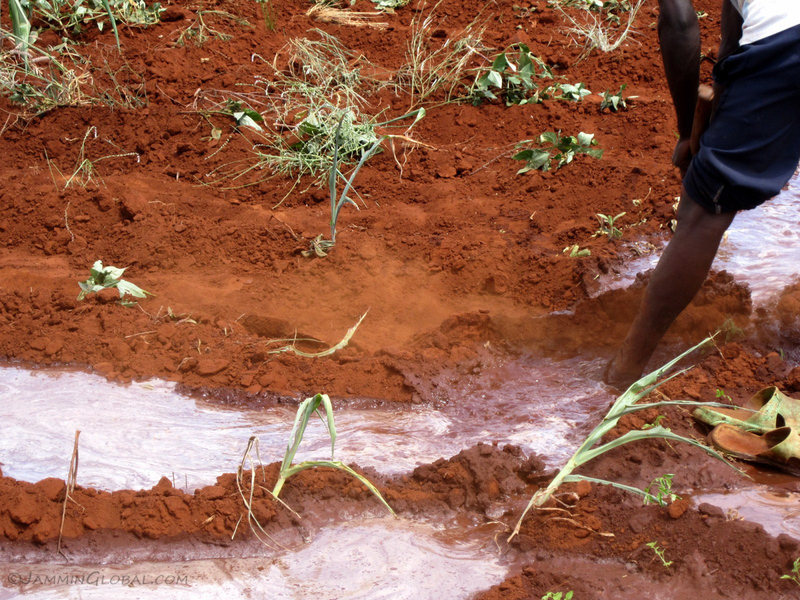 A crop such as sorghum would do better in these soils, but changing farmers’ diets is not an easy challenge. It’s interesting that maize is considered a staple crop in so many African countries where locals can’t imagine eating anything else nowadays, even though it was only introduced a few centuries ago by European traders, such as the Portuguese who brought it from Latin America. 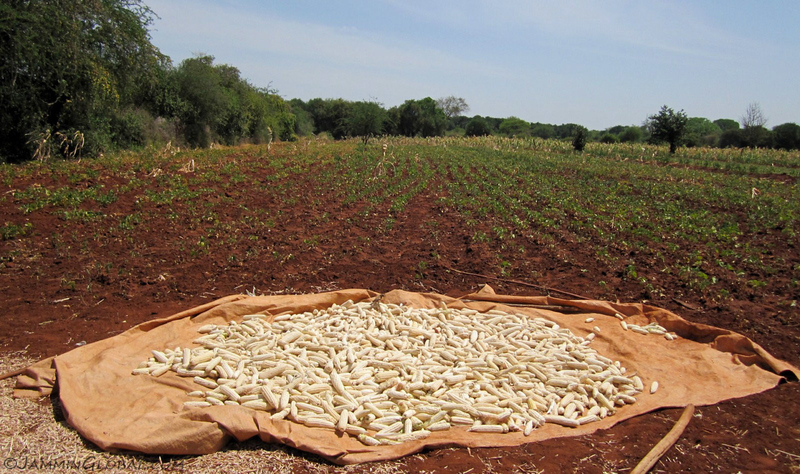 White maize being dried in the sun before the kernels are broken loose and pounded down into maize meal for ugali. A field of green grams (moong dahl) in the background. 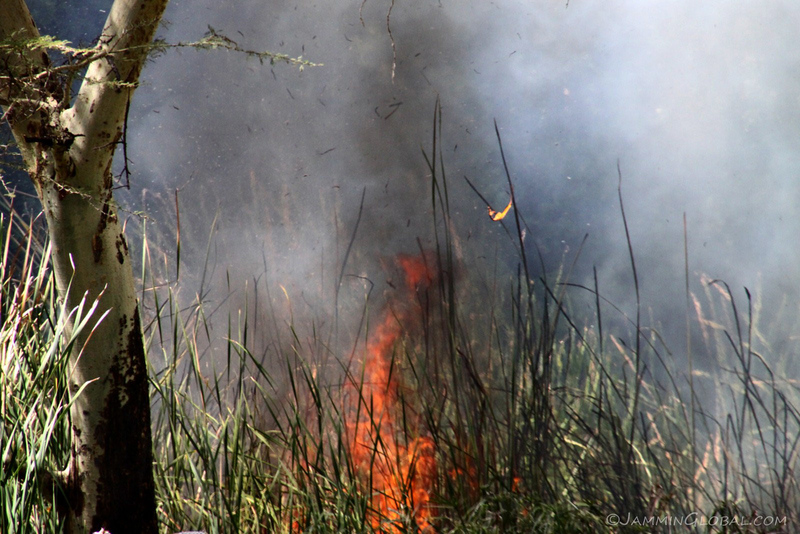 Some slash and burn agriculture going on. It’s still the easiest method for farmers in clearing land for agriculture and the ash helps in soil fertility. There’s a big push to reduce this land clearing technique since it releases a lot of carbon dioxide into the atmosphere, but I’m sure it pales in comparison to one long-distance plane trip, which probably releases more harmful greenhouse gases directly into the upper atmosphere than these farmers will probably release in their whole lifetimes. 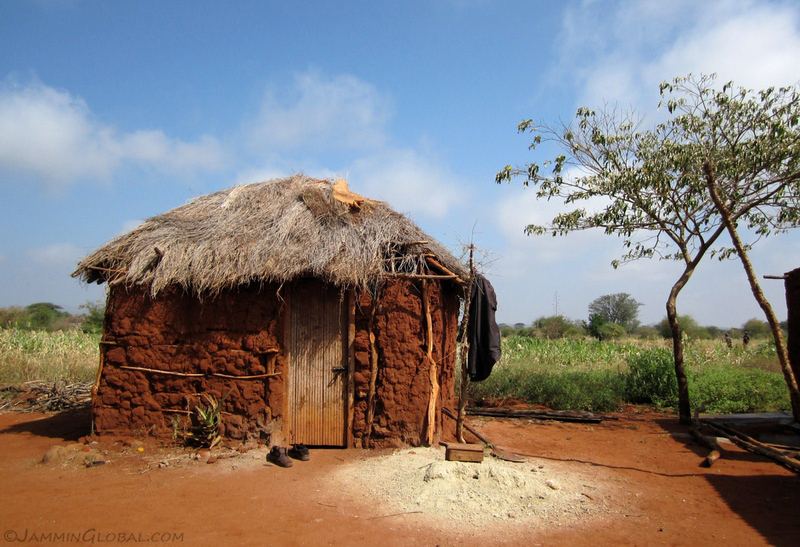 The Kenyan savannah is dotted with big old baobab trees and many farmers have setup their homestead near such trees, maybe as it provides a landmark in an otherwise flat land. 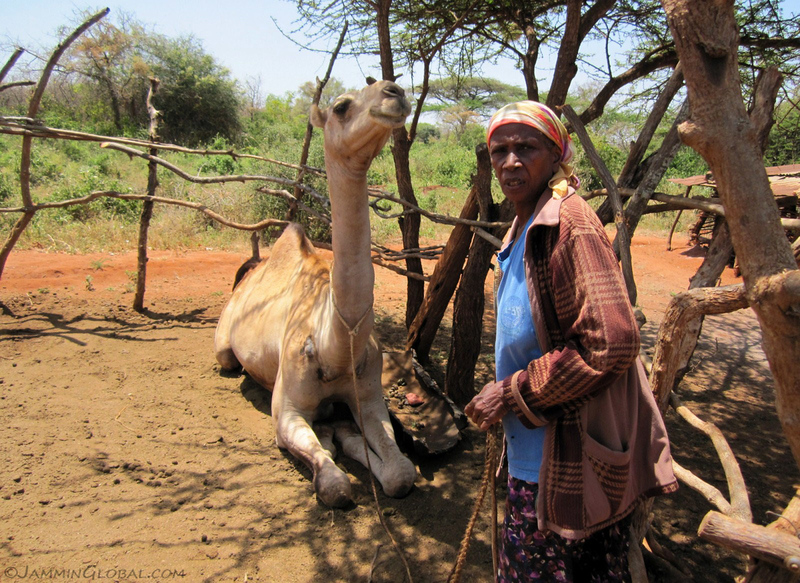 Mary Mbithi was managing a big plot of land and the local research institute gave her this dromedary camel to help in ploughing the land. 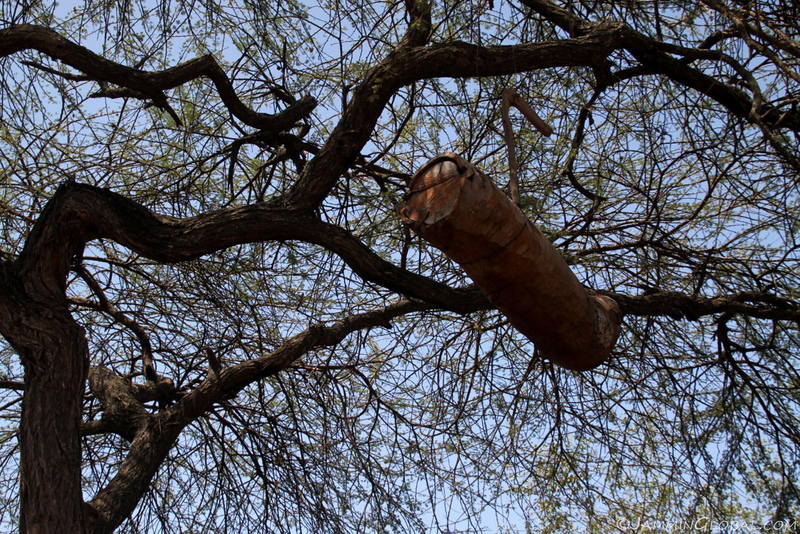 Besides farming a variety of crops, she was also producing honey in these hallow trunks hung up in baobab trees. 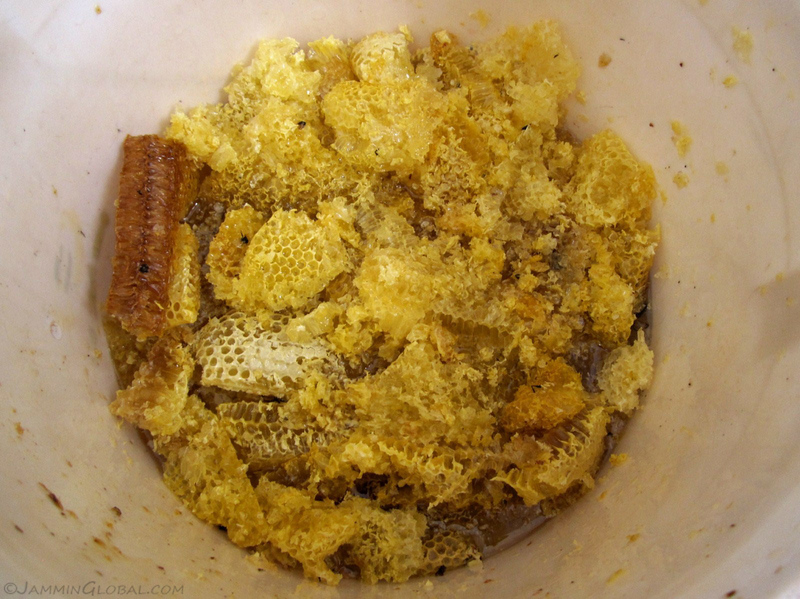 A bucket full of just-harvested honeycombs. 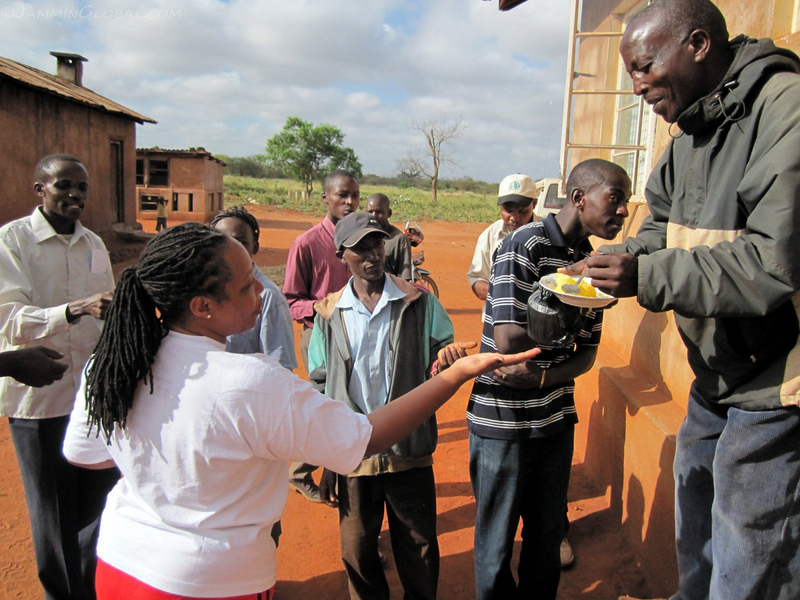 Mary Mbithi let all of us taste some of her honey and here Pastor is handing out the blessing to everyone. 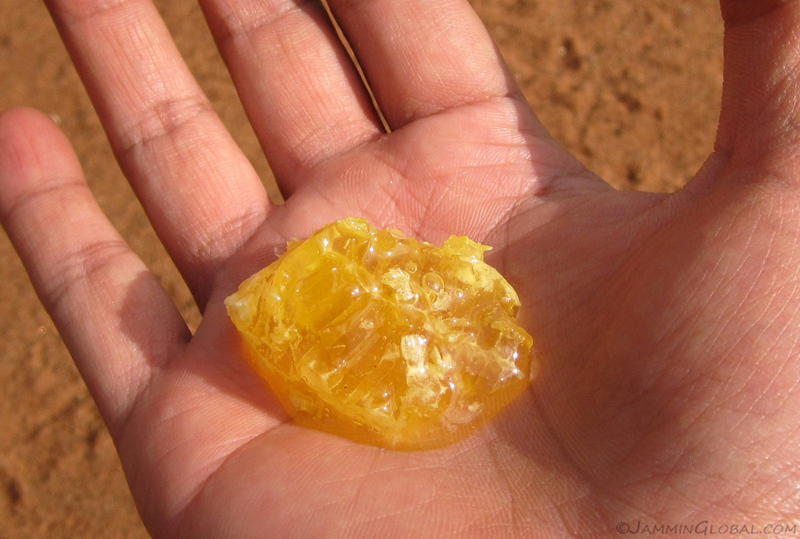 A chunk of pure honey. It tasted super sweet and was full of flavor from the local pollen. I bought two jars from her. 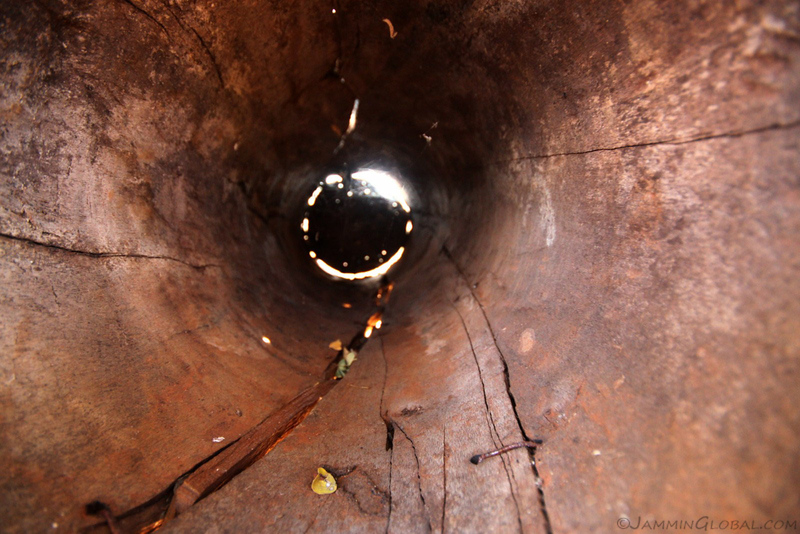 Inside an empty tree trunk used as a bee hive. 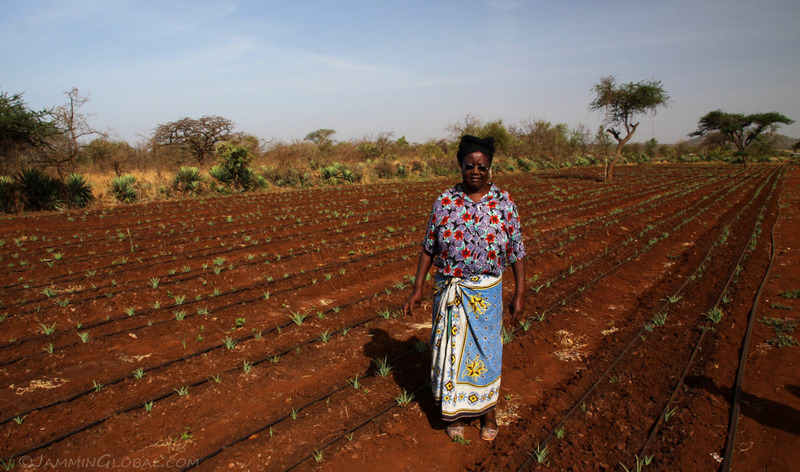 Another successful woman farmer, Asha Mbondo, was investing in drip irrigation. That’s where pipes are laid across the farm with small holes at each plant to provide just the right amount of water without wasting any to evaporation. 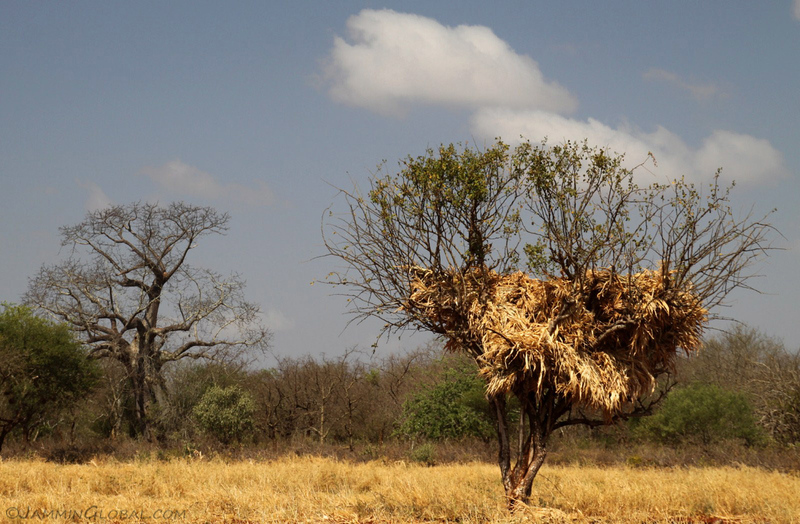 Farmers saving dried maize stalks in trees for animal feed later in the season. 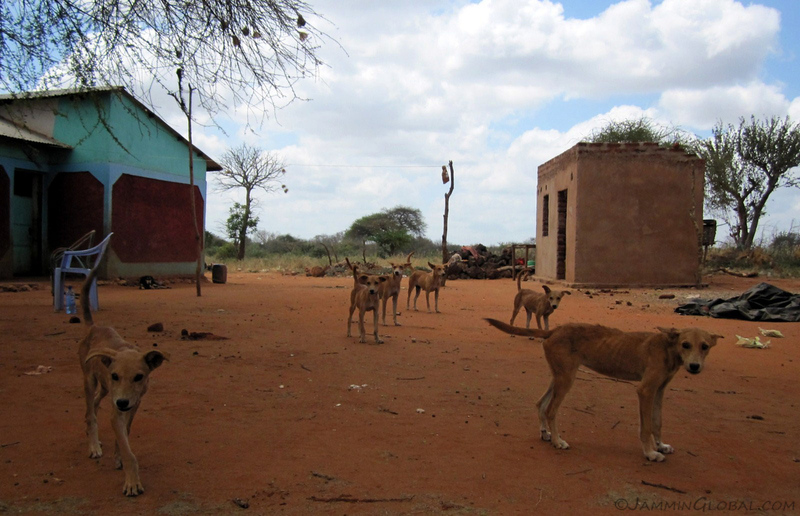 Most homesteads had at least one proverbial African farm dog around, but this particular one had eleven; it was hard to get them all to fit in one photo. 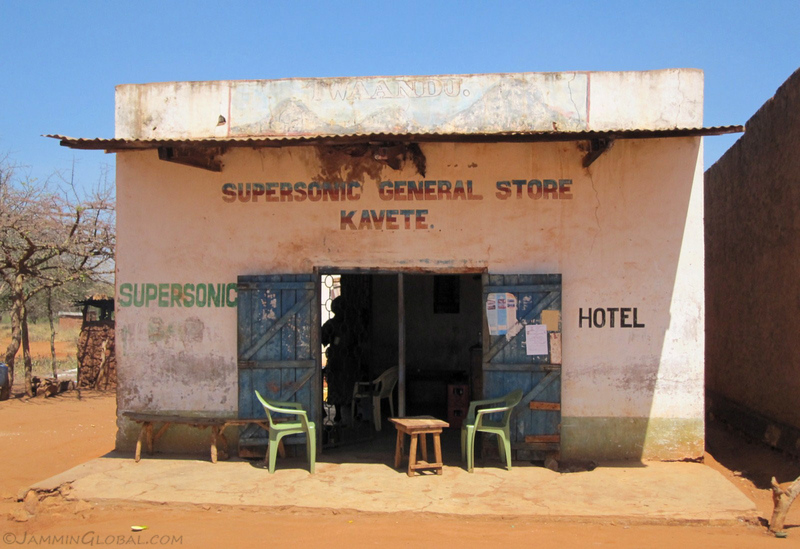 Stopping for lunch at the Supersonic Hotel in the small junction town of Kavete, deep in the bush. 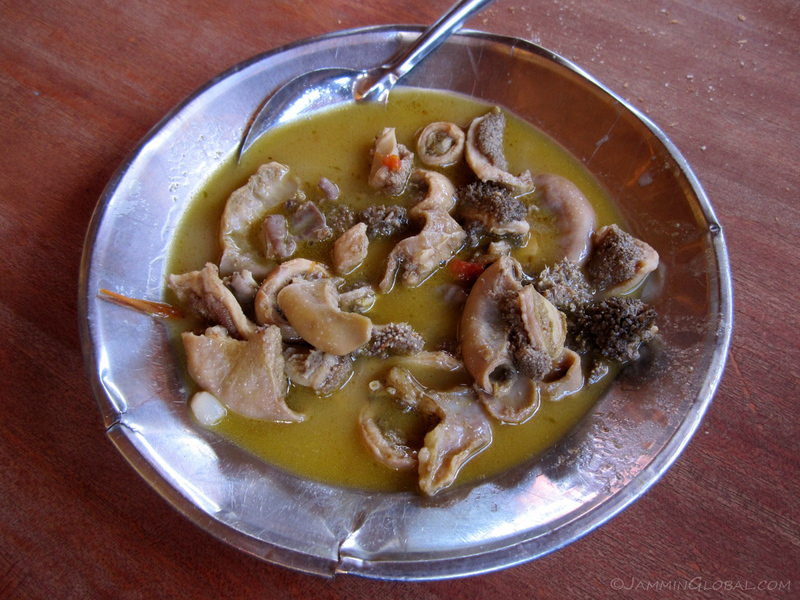 Some days Mama was serving Matumbo, a stew of cow’s stomach, tripe, which was hard for me to put down but you eat whatever you’re served. 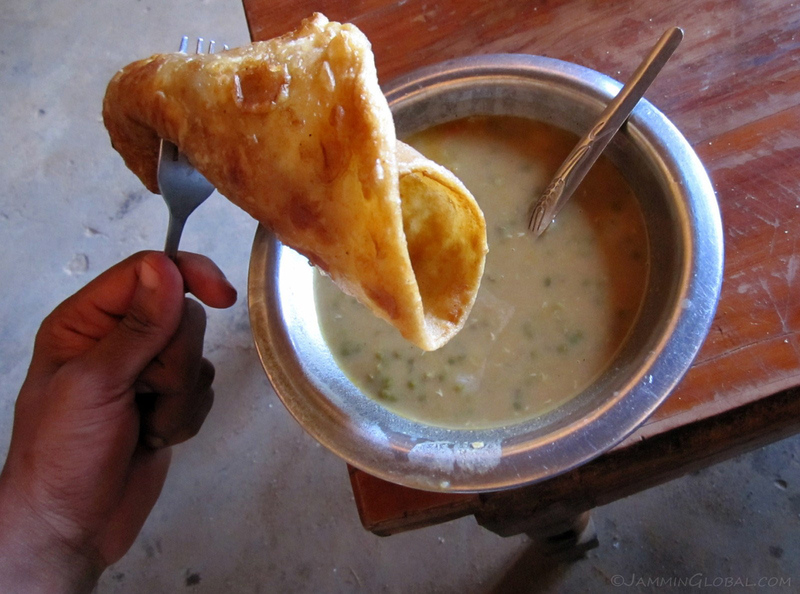 Other days we were served Ndengu, a stew of green grams (moong dahl) with chapati, which was much more palatable to my Indian stomach. My field team on lunch break at Mama’s Supersonic Hotel. 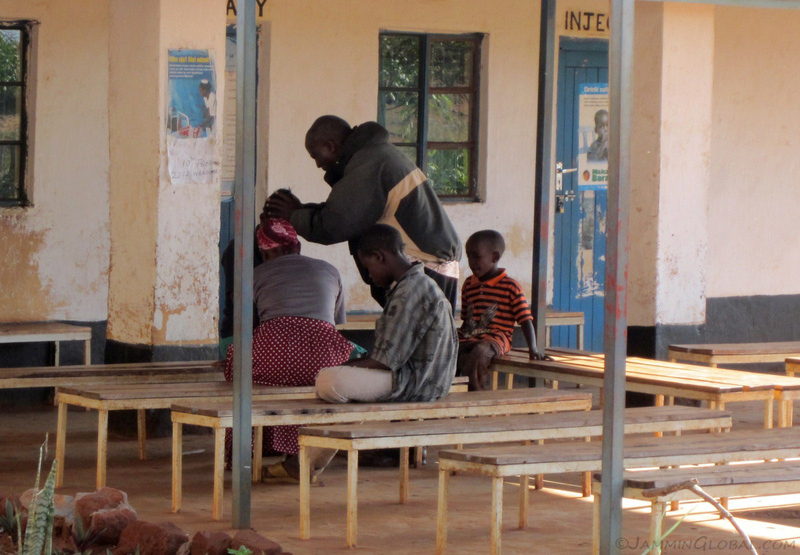 The total bill for lunch would come out to around Ksh400 ($4.30). 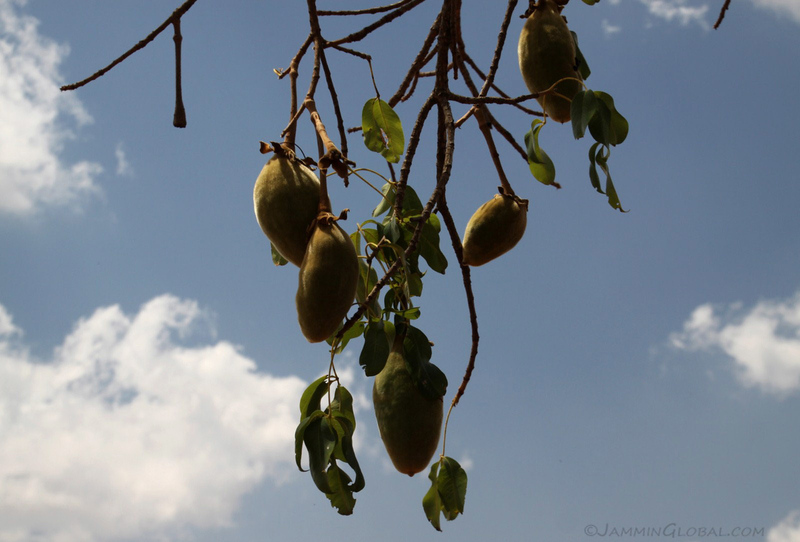 Lots of fruits grow in Kenya, but it seems to be lacking from the diet of rural people. 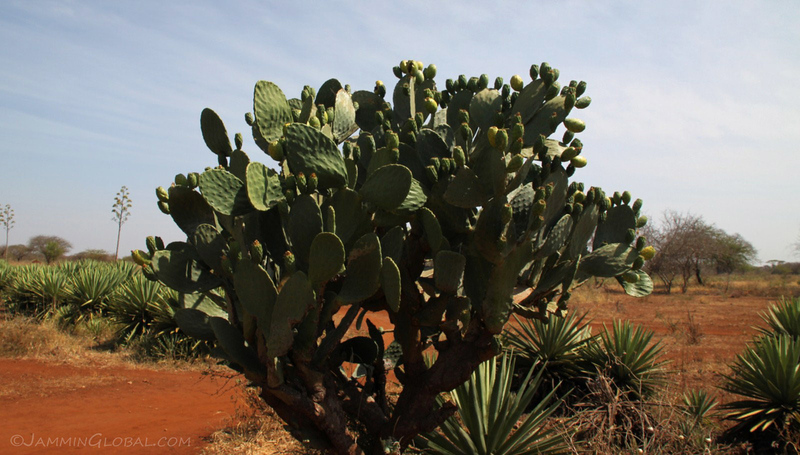 Here, on the property of one farmer was this prickly pear cactus in full bloom with the ripe fruits falling to the ground. 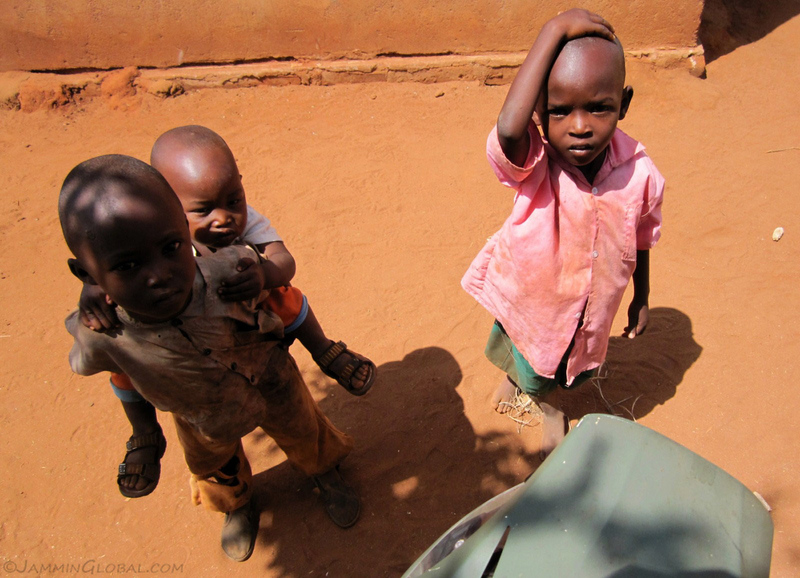 When I asked them if they eat these fruits, they said, yes, but only children eat them. 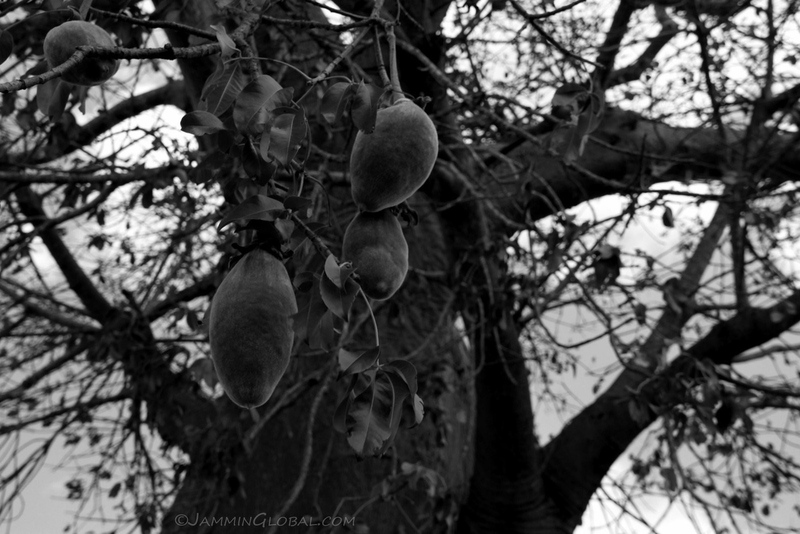 It seemed that it wasn’t a cultural norm for adults to eat tree fruits; an activity only suitable for children. Hmmm…. 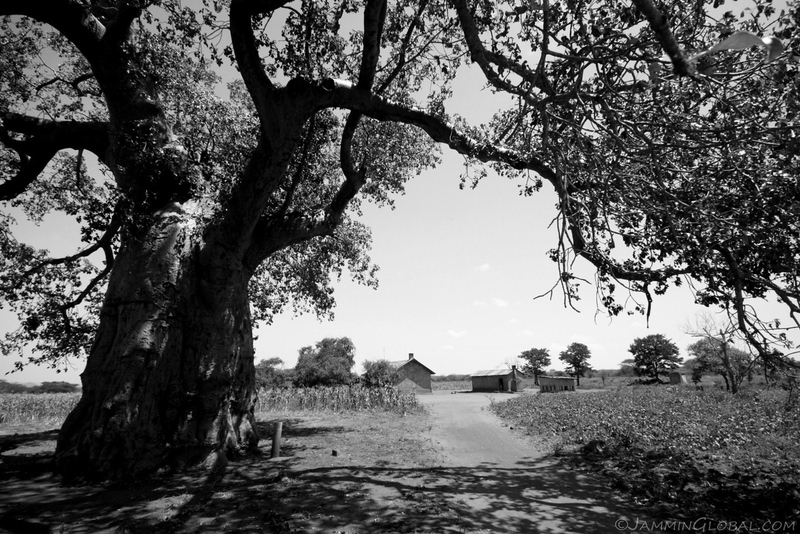 On the edges of another farm was this huge fig tree in bloom, again with no one picking the fruit and allowing the ripe ones to fall to the ground. To me it seemed that the farmers were foregoing a good source of nutrients and also an additional income source. 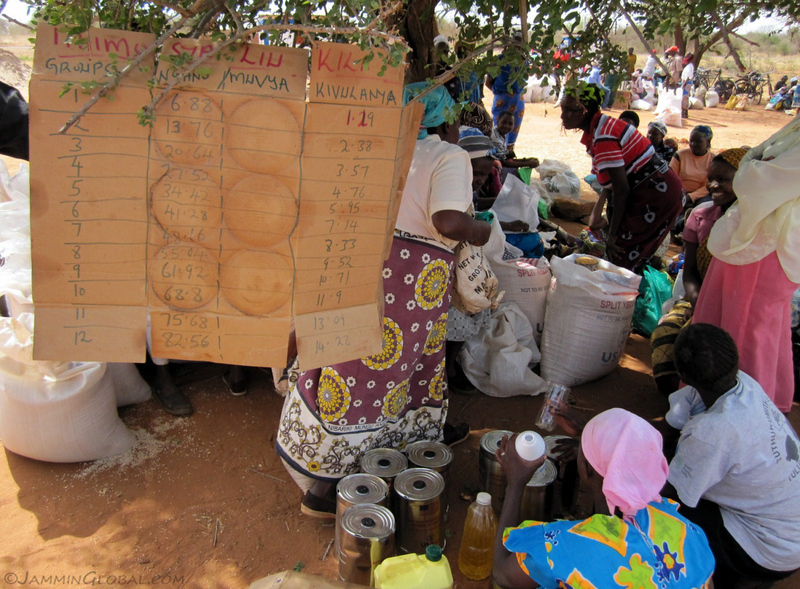 Fruits get a much higher profit than maize but this can’t be forced on the farmers. We can only tell them what we think is best for their livelihoods and then they have to decide how to live their lives. 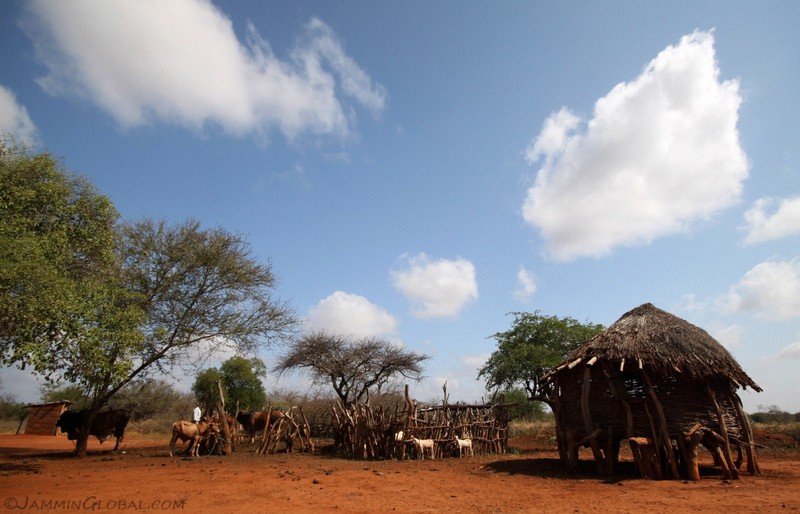 A typical farming homestead on the semi-arid plains of eastern Kenya. A woman and her family farming their land. 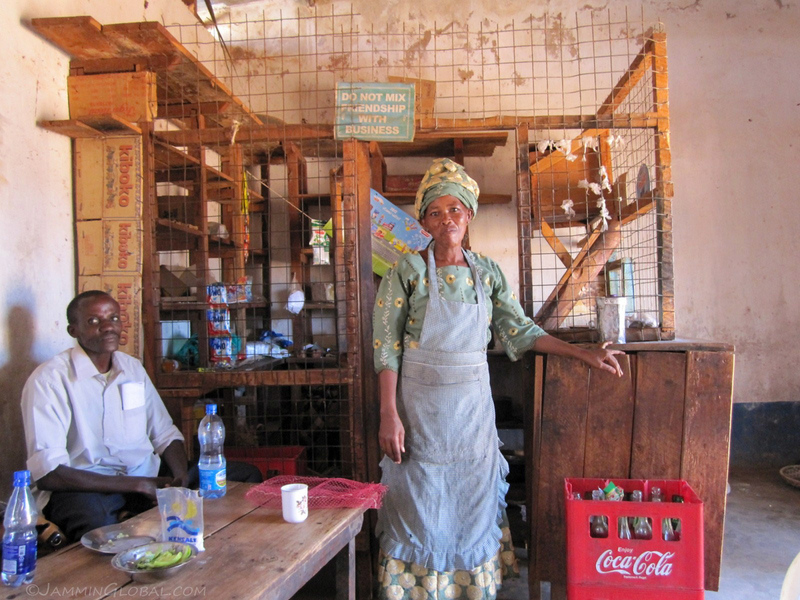 Her husband was living in town, earning additional income for the family, and this made her the de facto farm manager. Little kids interested in my helmet. A bull on a day-off from ploughing the land. 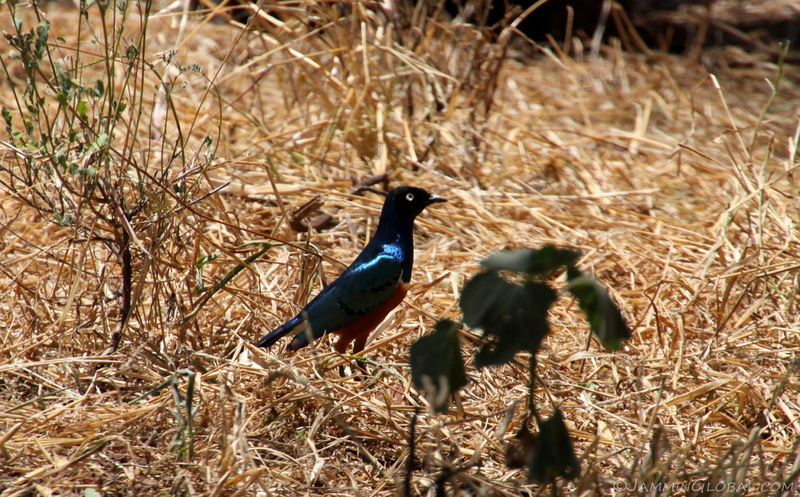 A photogenic Superb Starling, common on the savannah, easily identifiable by its copper belly and iridescent blue back and wings. An almost dried-out well on one farmer’s land. But the dry conditions don’t stop the baobab tree from thriving here. 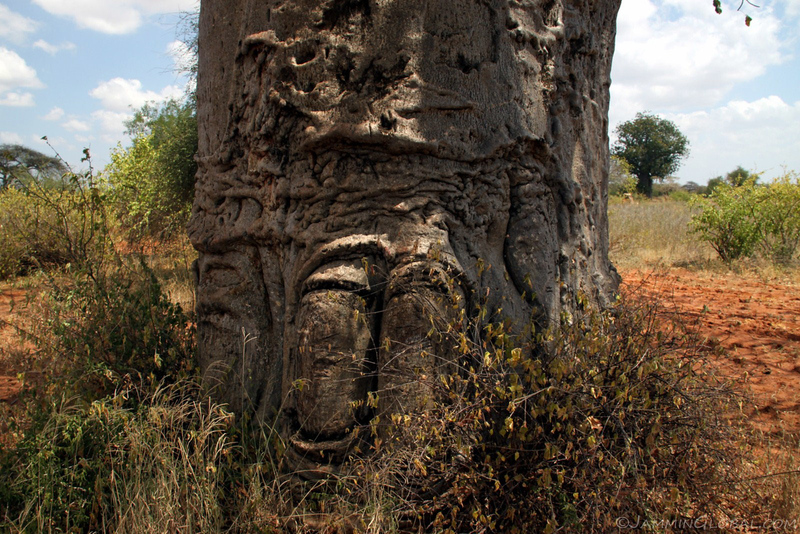 The huge trunk of a baobab tree, seemingly getting crushed under its own weight. 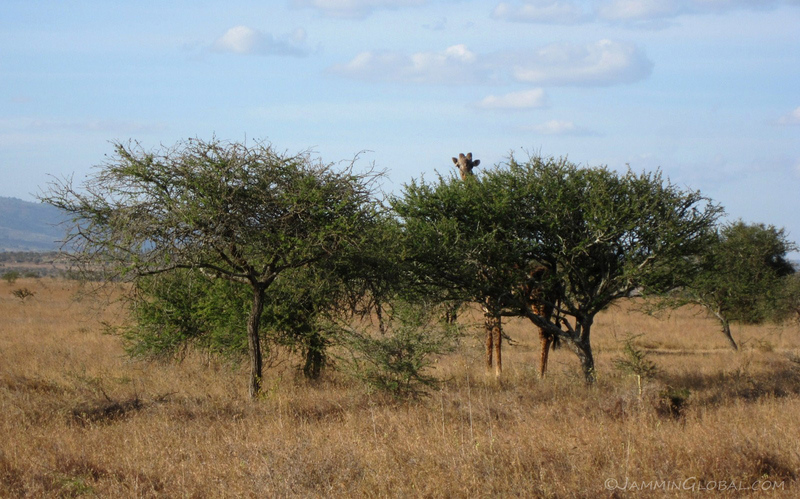 They store lots of water in their trunks and are a useful resource in the many dry areas of Africa. 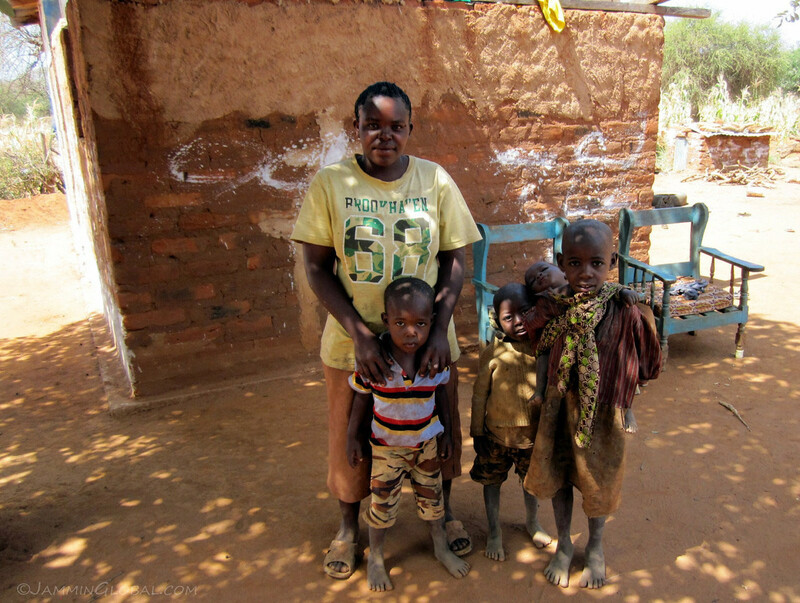 Some really huge baobabs can even become homes. 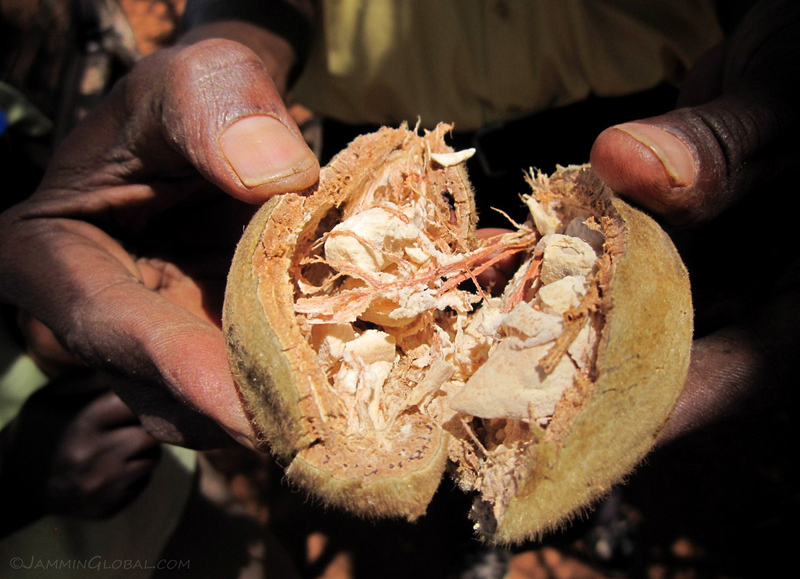 …but repeated pounding against a rock reveals the much-prized baobab seeds and the flesh surrounding it. It’s pretty acidic and tarty in flavor as it’s high in vitamin C, B and a host of other nutrients. The seeds can be ground down and have found recent use in cosmetic products. 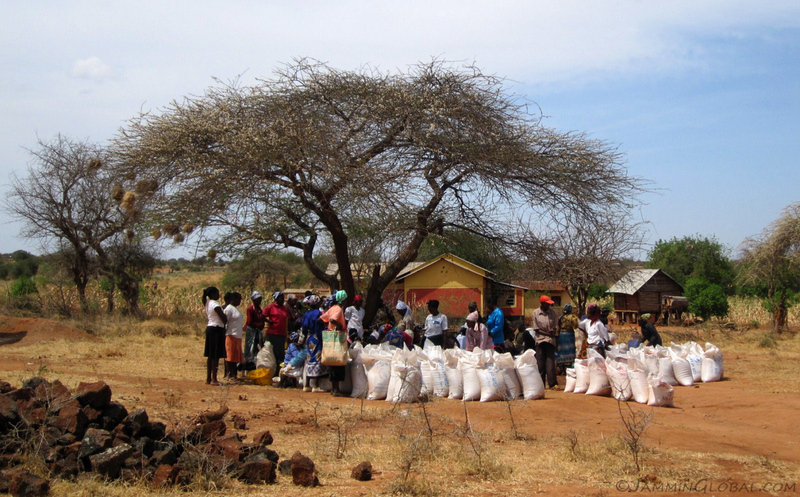 …collecting their monthly food aid handouts. 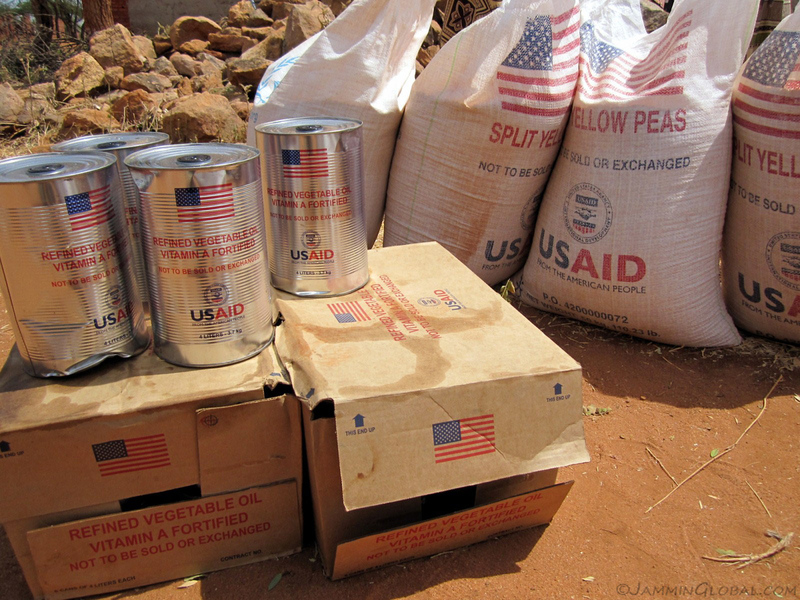 …and US-AID, which provided cereals, legumes, cooking oil and salt. The distribution of the food was governed by a formula based on the number of mouths to be fed in each household. Before receiving the aid, every household had to register and prove the number of the mouths that were claiming needed to be fed. 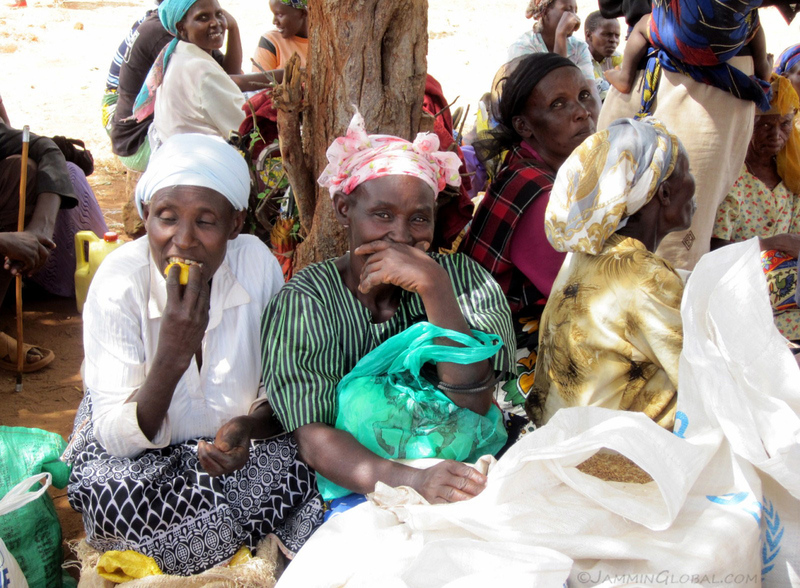 These women, waiting their turn to receive their food aid, put on a smile for the camera. There was much laughter going on and it belied the seriousness of the situation where these farmers were not able to meet half their monthly food needs. 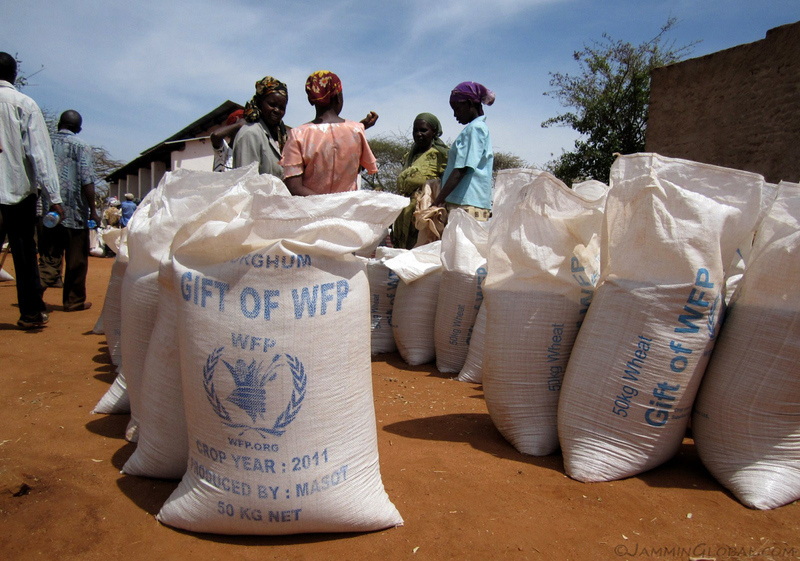 On the flipside, I heard criticism from successful farmers that food aid was making the less successful farmers a bit more lazy and dependent on the aid handouts. 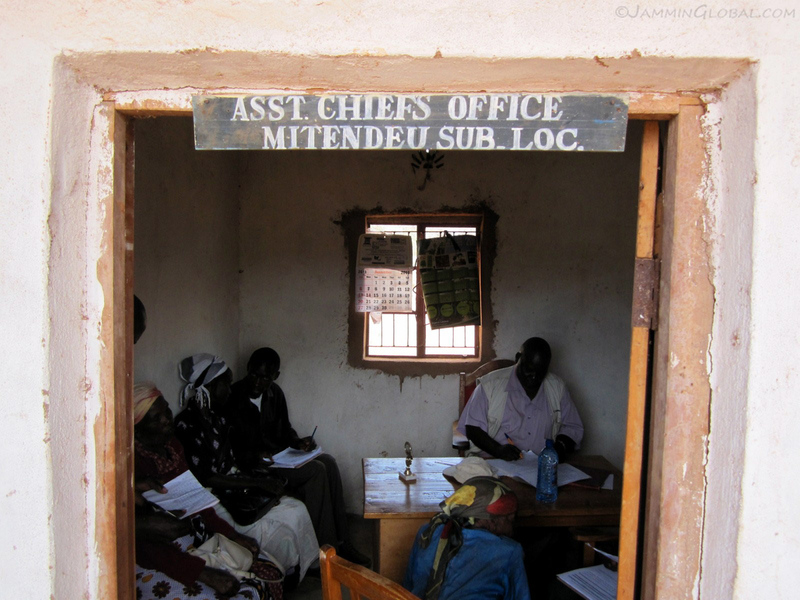 My field team interviewing farmers in the assistance chiefs office of the Mitendeu sub location. 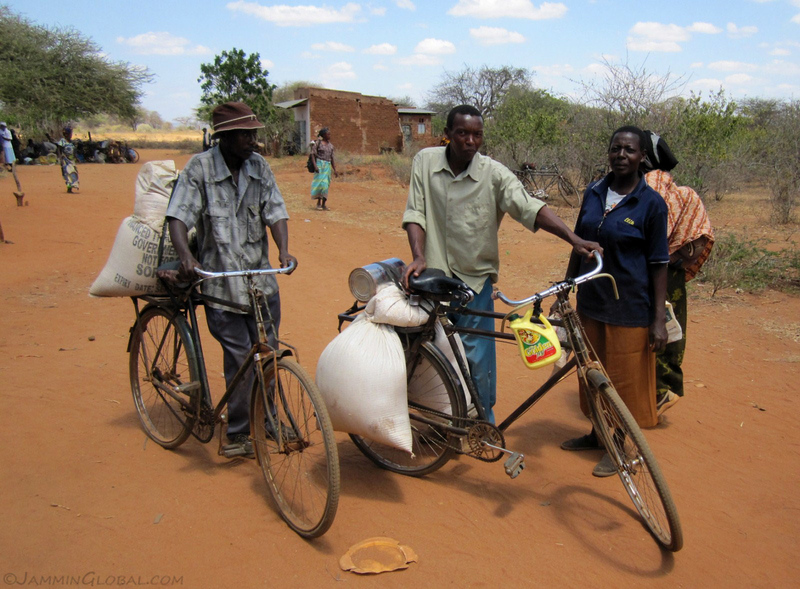 These farmers were lucky enough to own bicycles to take their food handouts back to their farms and I wondered how the others managed to haul these heavy grains of sack back to their kitchens. One morning, as our team was getting ready to head out into the field, a local resident came running up and asked that Pastor come quickly. A girl was apparently possessed by spirits and talking in tongues. Pastor was first and foremost a Christian pastor but I saw that he was also in touch with his tribal customs and their belief in spirit possession. He talked forcefully to the spirit and demanded that it leave this girl. 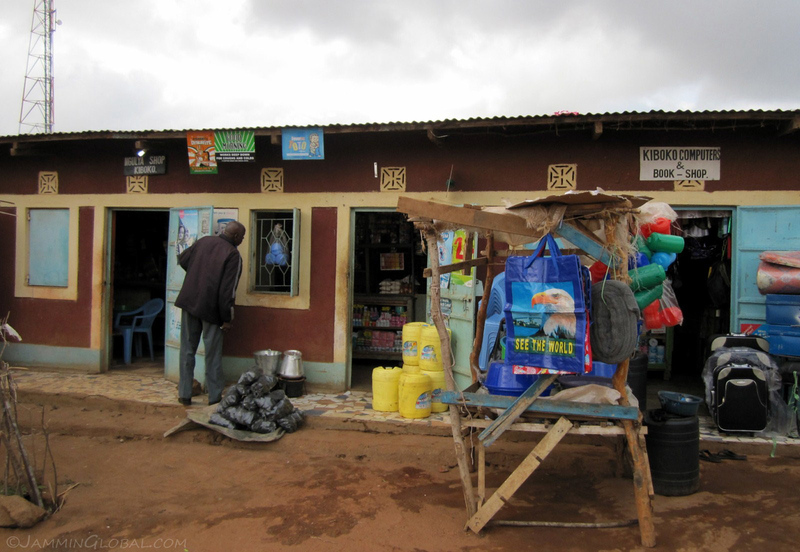 A few shops at the Kiboko junction on the highway with a cell phone tower in the background. Even though I was quite far from urban areas, I was enjoying fast 3G mobile data on my phone. 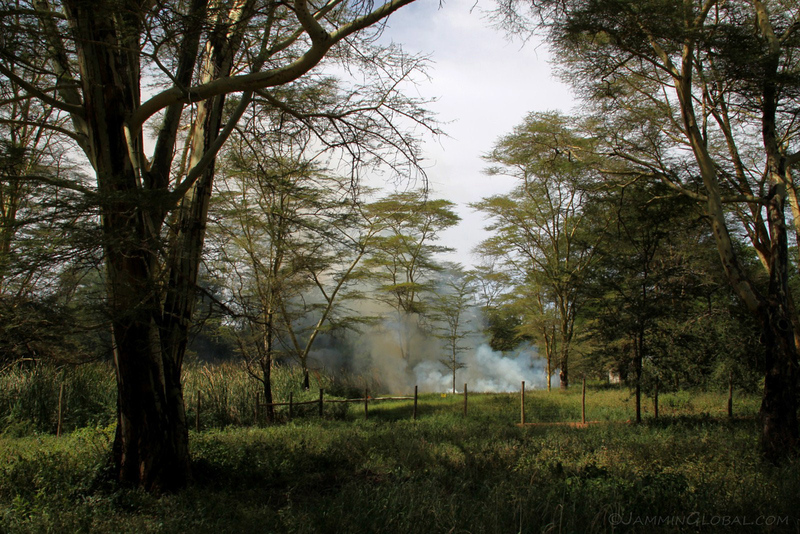 On one weekend, I heard a crackling noise out the back of the guest house compound that I was staying at and saw a wild fire in progress. 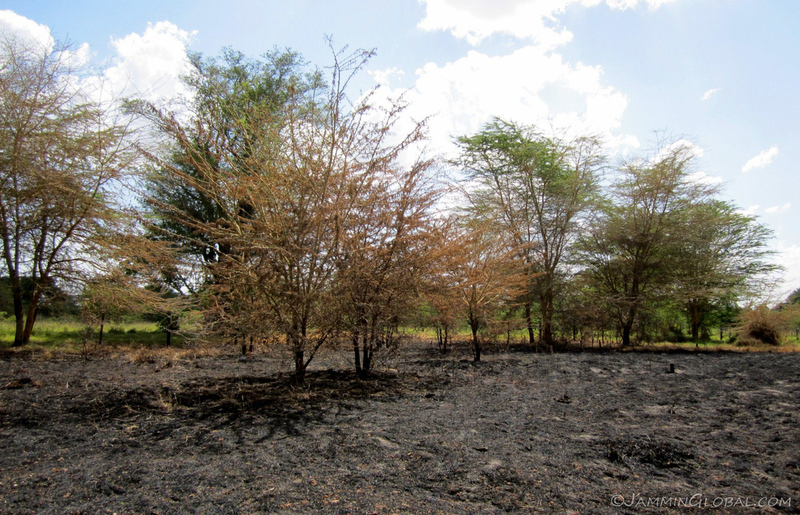 It was exciting to see the flames leaping up and teasing the higher reaches of the acacia trees, which are used to such frequent fires, and I figured I would sound the alarm if the fire reached the compound wall, but it soon died down and life on the savannah continued as normal. 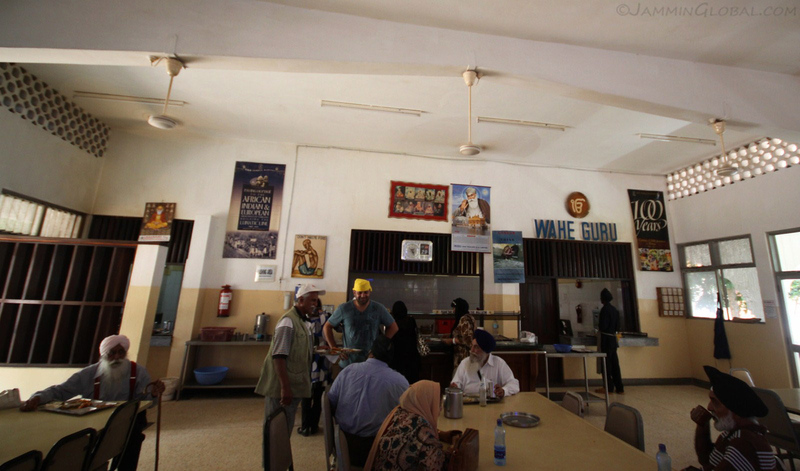 Being an Indian, I had heard of the Gurdwara in Makindu, a holy place for Sikhs, a religious community from India. 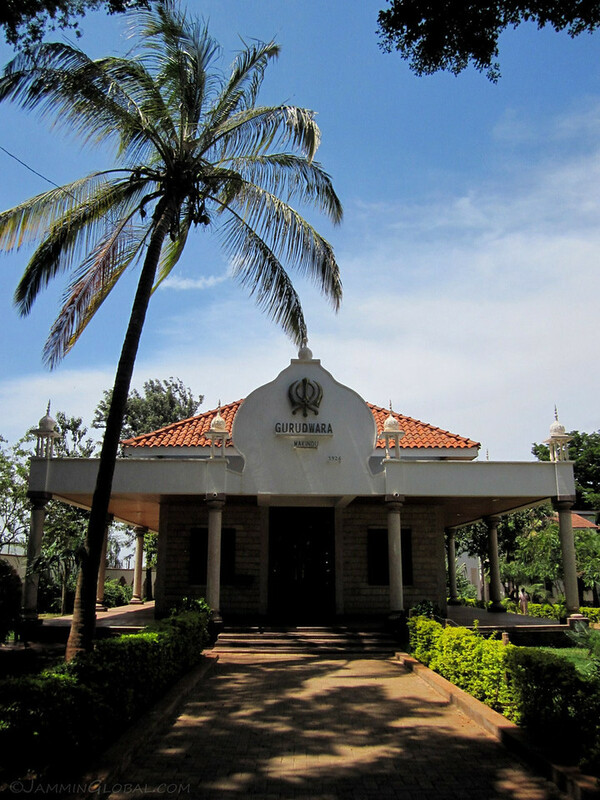 Sikhs were brought over by the British to help build and run the Kampala to Mombasa railway line and since Makindu was a major service point along the railway, just like Nairobi was, many Sikhs would gather to practice their religion. 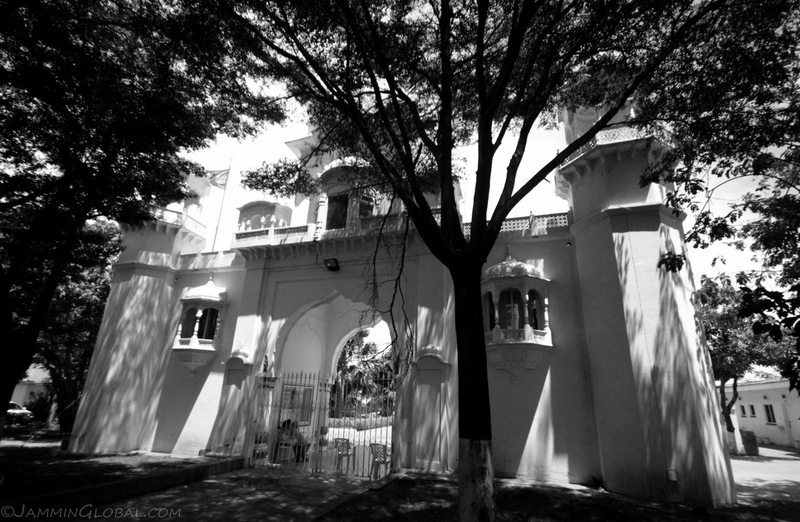 The Makindu Gurdwara started out as a little shack during the railway days and from 1926 onwards, donations from Sikhs and non-Sikhs living in Kenya saw the gurdwara grow into the sprawling and beautiful site that it is now. A feature of all gurdwaras is the Langar, the open kitchen, where tasty vegetarian food is served 24 hours a day, free to anyone from any background. The only stipulation is that you should cover your head in a provided headscarf, mainly for health reasons so that hair doesn’t fall in the food. The langar was started by the first guru of the Sikhs, Guru Nanak Dev. He wanted to bring about the principle of equality between people of different religions, castes, color and social status, which was a revolutionary idea in the 16th century caste-ordered society of India, ruled by Hindu norms. 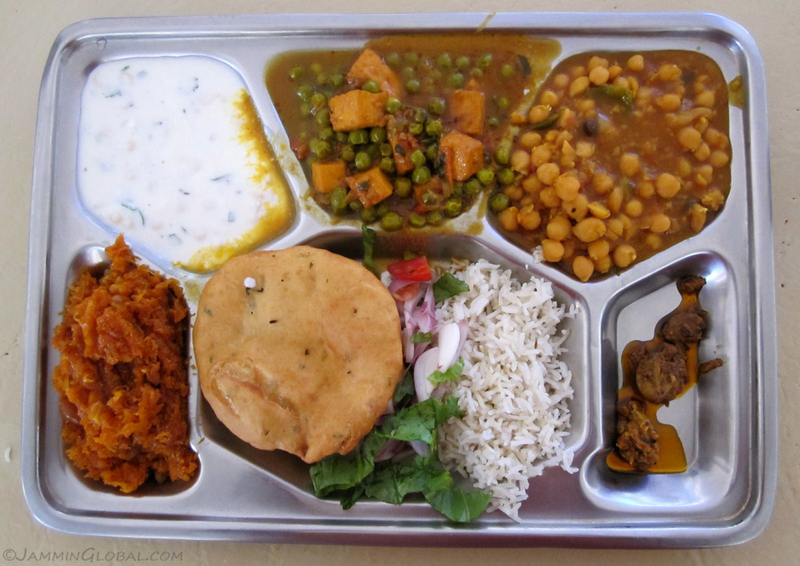 A tasty serving at the Makindu Gurdwara’s langar of channa curry (chick peas), mutter paneer (green peas with cheese), rice, poori, raitha (spiced yoghurt) and a desert of carrot halwa. The food is free to anyone and if one feels like it, they can give a donation, which keeps the place running. 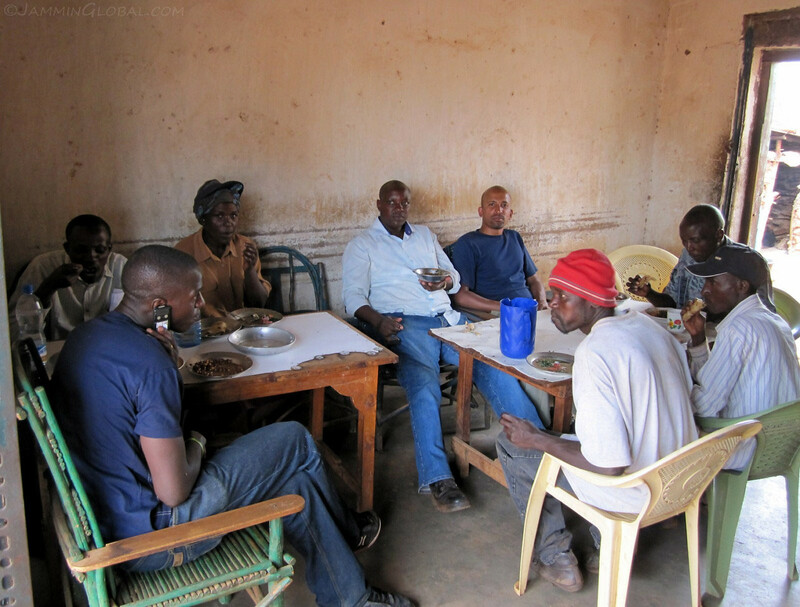 I invited my whole Kenyan field team to come out for a free lunch, but since no meat was going to be served, none of them came. 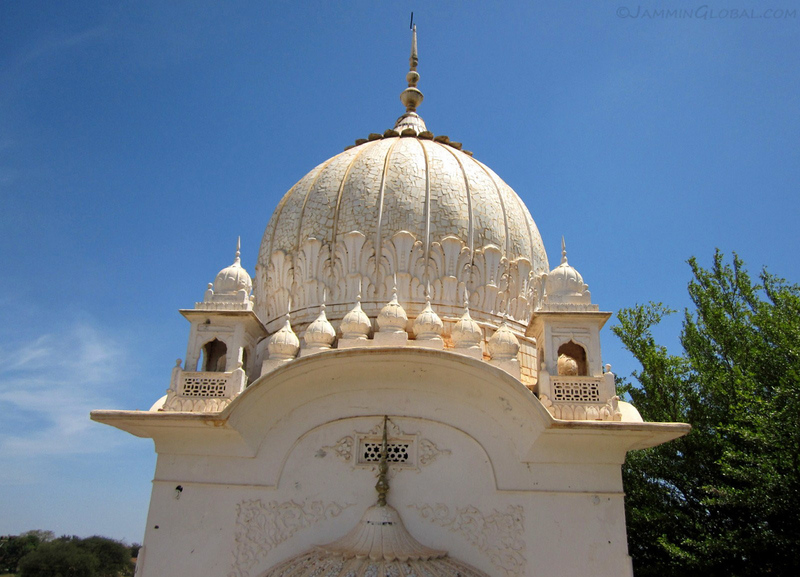 The beautiful dome of the Makindu Gurdwara. 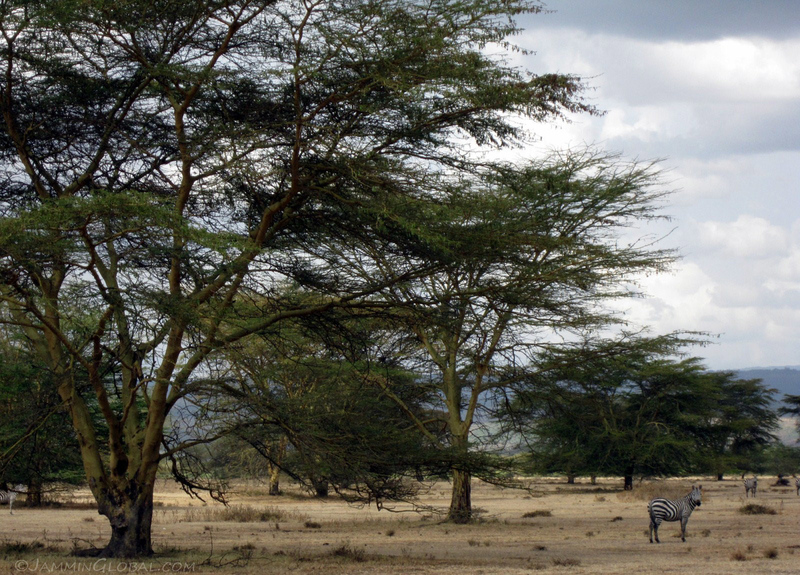 It’s a peaceful location, providing a tranquil setting to calm the mind from the cacophony of a Kenyan highway town outside. 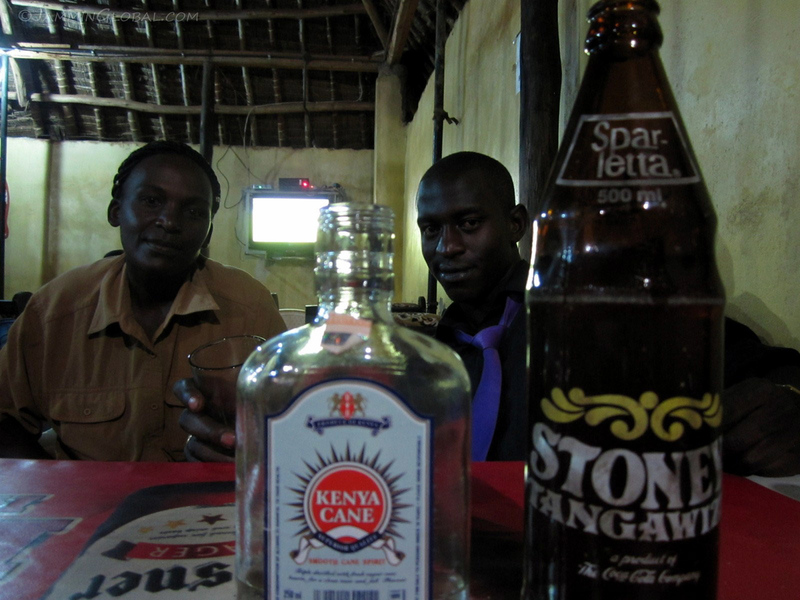 On a night out with my field team at the end of our field work, enjoying some Kenyan cane alcohol with Stoneys, a ginger beer. 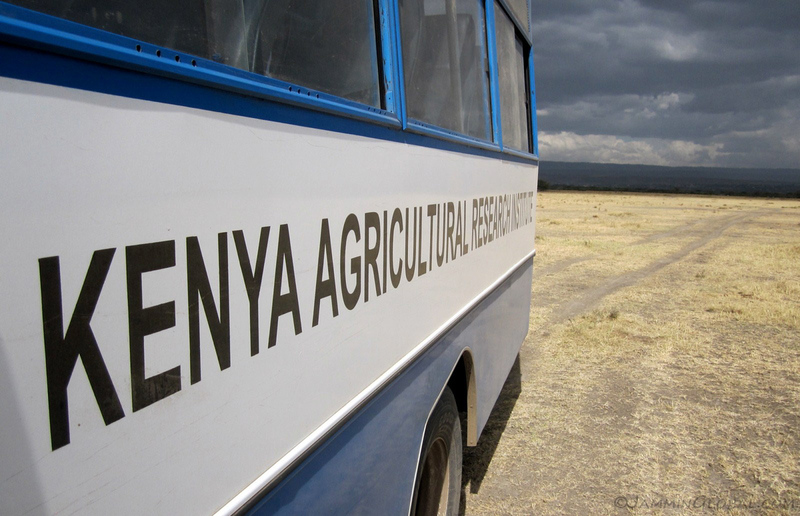 After my stay in Makindu, I headed up to Naivasha for a workshop at the KARI center there. I was learning a new crop simulation program among the beautiful grounds, which housed lots of wildlife, like this zebra. 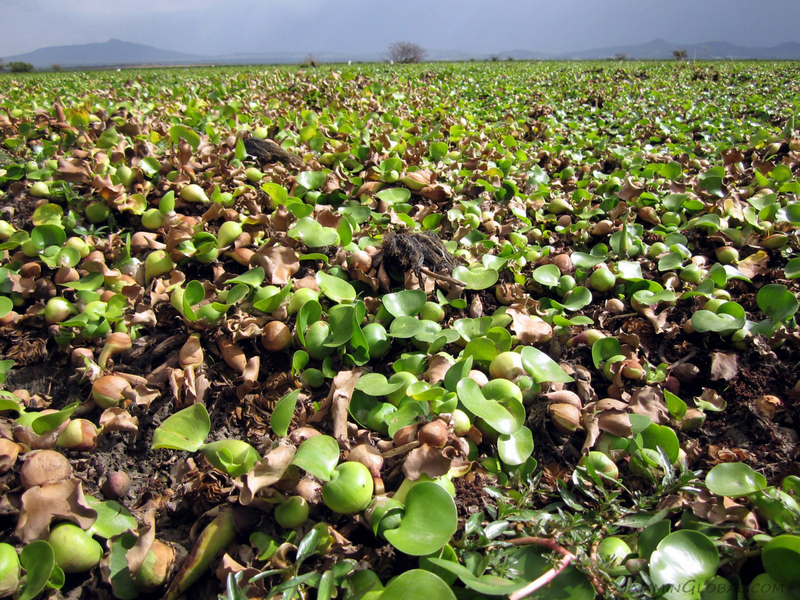 A sea of water hyacinths covering the northern shore of Lake Naivasha with Mt Longonot in the background. The plant is considered an invasive species due to its fast growth. Its blanket coverage results in a choking off of oxygen for the water below, resulting in the killing of fish and its leaves, close to the water, provide an ideal habitat for mosquitoes. 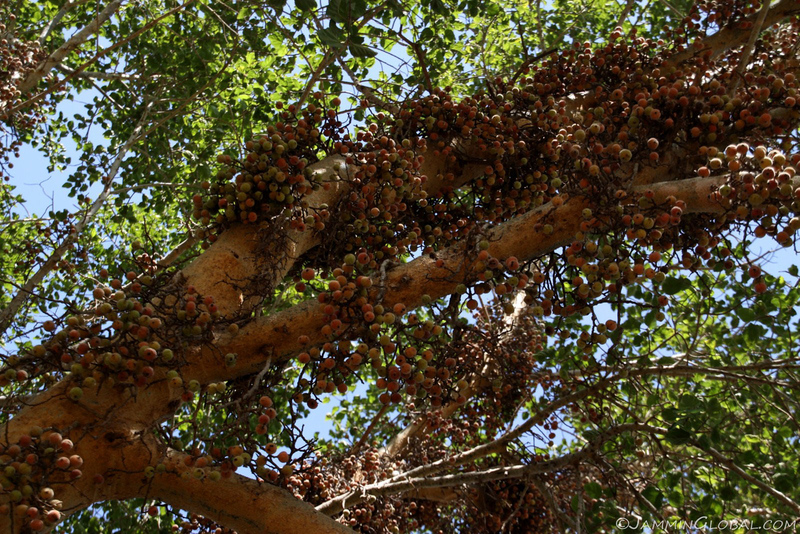 They’re native to the backwaters of Venezuela and were introduced as an ornamental plant, but now are growing out of control. My time with the Kenya Agricultural Research Institute was coming to a close and I thanked everyone who helped me with my research fieldwork. 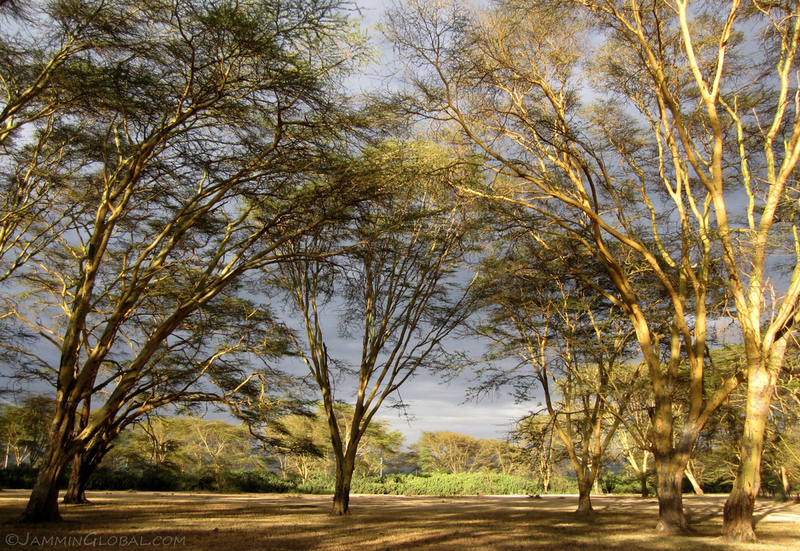 A parting shot of a tall stand of Acacia xanthophloea, glowing in the setting sun. 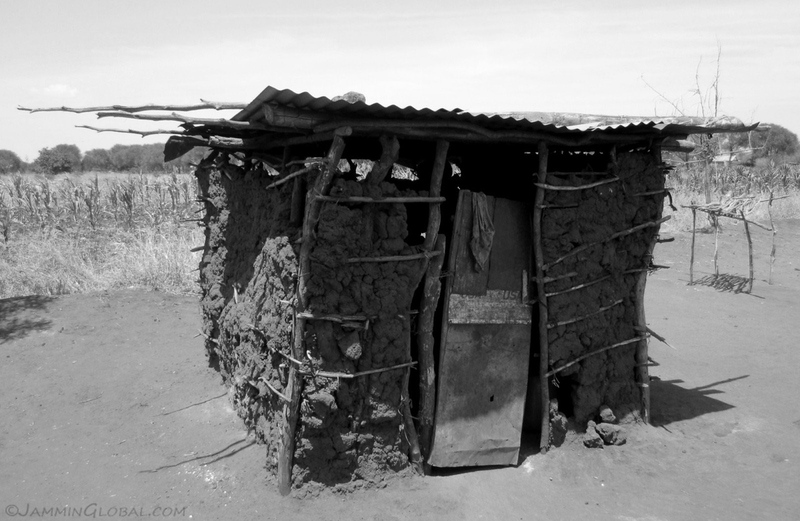 In two months I spent in the field of eastern Kenya, I managed to see how rural people were farming marginal lands and trying to eke out a living on the land. 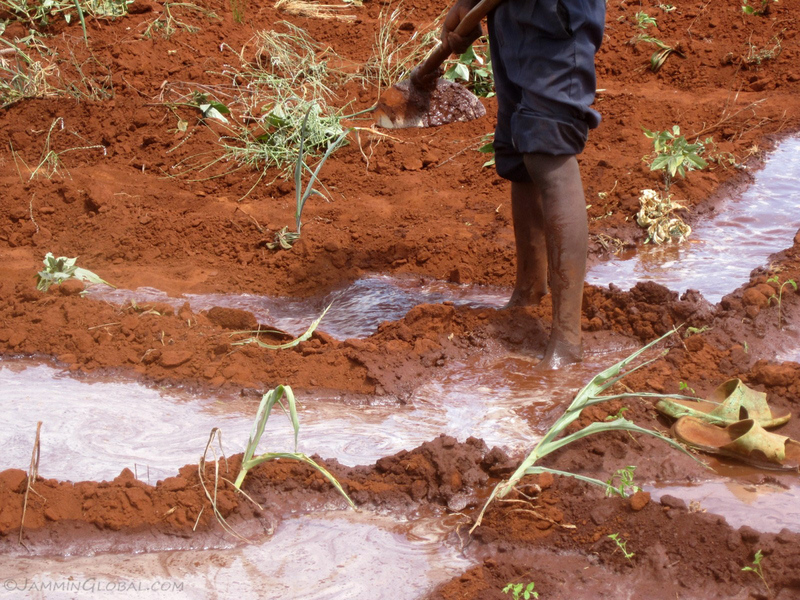 They’re dependent on the rain to irrigate their crops that provide their sustenance, but lately, the rains are becoming more erratic, either arriving early or late, dumping just a few showers or flooding the region. 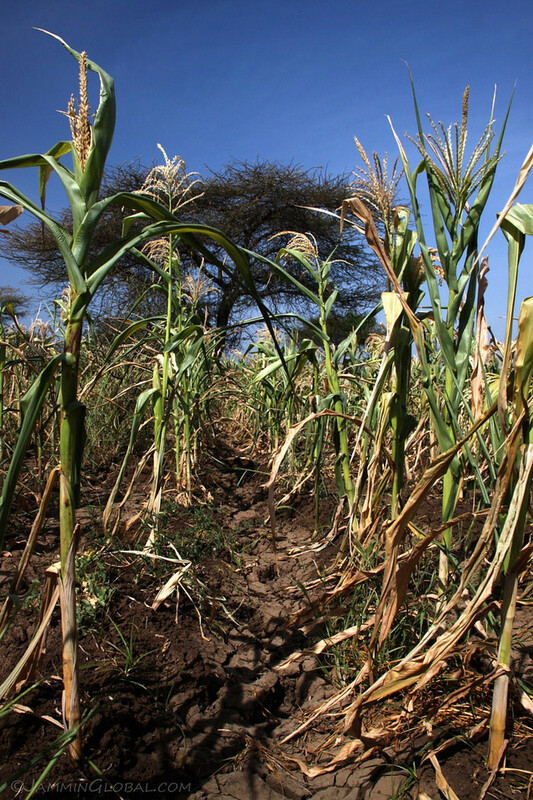 This instability is affecting farmers’ ability to adapt to their changing climate and pushing them to seek out food aid in order to survive. My research was focused on seeing whether there were any difference between women farm managers and men farm managers in their agricultural water management ability and in the end, I didn’t find much difference between the genders. Some women were worse off than men in general, but statistically, there was no significant difference. This is a good sign as it means that contrary to past research where women farmers were considered to be worse than their male counterparts, women farm managers in the two locations that I conducted my fieldwork in were just as adept at managing their water as men farm managers. I hope this is a growing trend for the many disadvantaged women farmers across Africa. 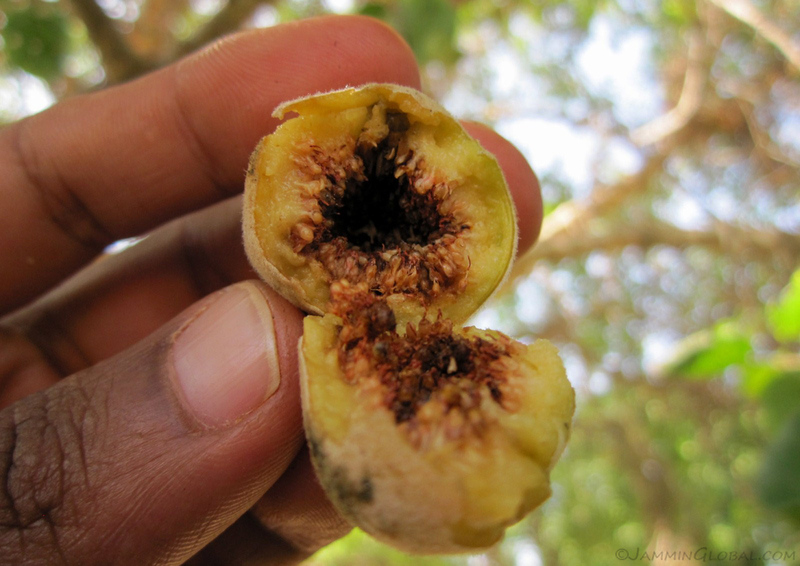 I’m planning to visit Kenya (Kiboko & Makindu) to conducts some research with intentions to start macadamia farming. Which is the best way to contact you with any questions that I may have regarding your trip to this area. For example, I’d like to know how much you paid per night at the guest house in KARI Kiboko, and how much an average meal would cost me.